Yamato Scientific | New Year Greeting from Yamato Scientific Co., Ltd.
New Year Greeting from Yamato Scientific Co., Ltd.
2015-01-13 New Year Greeting from Yamato Scientific Co., Ltd. Happy New Year to all of our valued customers and business partners! We, the Yamato Scientific Group as a whole, will try hard to provide you with continued cordial support in 2015 with fresh vigor! 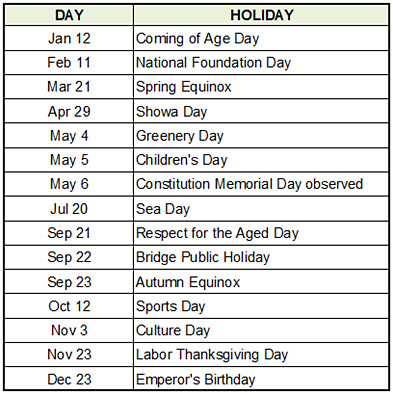 Public Holidays in Japan are as below.